Slug Gone Wool Pellets are a natural, organic way to keep slugs and snails away from plants. These pellets form a highly effective textured barrier. 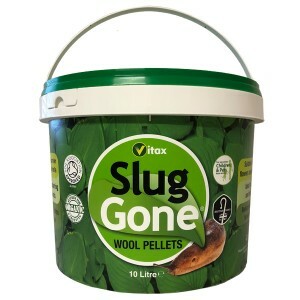 Suitable for organic gardens, Slug Gone pellets are produced from wool and are ideal for using around fruit, flowers and vegetables, and are perfect for use in tubs and baskets. To use, simply lay the pellets on the compost around the stems of plants, and water. Once wetted, the pellets self-felt to form a continuous mat around the stems. The minute fibres in the mat are an irritant to slugs and snails, and the mat also absorbs moisture from the slug’s foot, making it extremely difficult for them to travel across. For best results apply Slug Gone in a 10cm (4 inch) wide band around the base of the plant. The wool pellet mat is also excellent at keeping the surface of pots dry, but retaining the moisture beneath. This means that weeds have difficulty germinating on the surface and frequency of watering is cut down due to reduced evaporation. As an organic material, Slug Gone contains naturally occurring slow release nutrients, and when dug into the soil after use it will help feed plants and improve moisture retention. It is a biodegradable protein fibre which releases nitrogen, potassium, sulphur and other trace elements essential for plant growth. Size/Pack Size: 10 litres.